Sometimes it gets a little confusing when dealing with scales and track gauge. Here's a brief overview. G (LGB) 1:22.5* 24 3/4"
* Manufacturers of G scale trains use different proportions for their equipment. I've listed LGB because it is the original. Track gauge may vary from broad to narrow. For example, G scale trains can be different sizes, but all use the same width track. 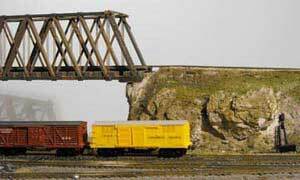 If you're interested in S gauge, I recommend you check out the National Association of S Gaugerrs at www.nasg.org for a list of manufacturers' websites. There are photos and a video of Hank Duivenbode's excellent Maple leaf Junction S gauge layout we visited during the NMRA NFR's 2009 Woodstock Turn convention. Narrow gauge often means 3-foot gauge (as in HON3). Sometimes you'll see HON30 which means the track gauge is 30" or 2 1/2 feet. Standard gauge in North America is 4-feet, 8 1/2 inches. This is the most common model track. If you have never visited the Miniatur Wunderland website, be sure to have a look to be inspired about what can be done with time, money and a large dose of creativity. A truly amazing model railway trip around the world. This is probably the biggest and most detailed model railway anywhere. It features European and North American trains and scenes. There is a similar project underway in Toronto, Canada that may open to the public in 2016-17. Narrow gauge railroads were usually built over rugged terrain. The smaller equipment and narrow rails made building the line less expensive. The East Broad Top and Coal Company railroad is a famous line on the Eastern seaboard of the United States. It still operates as a tourist line. Many narrow gauge railroads were built throughout South America, mainly due to the terrain difficulties. There were narrow gauge lines in Argentina, Brazil, Chile, Columbia, Ecuador and Peru. Some still operate and a few have been featured in railway videos or on television. Other famous narrow gauge lines were built in Colorado and New Mexico to reach the ore mines. One of the favorite books in my railroad library is The Rainbow Route , an illustrated history of the Silverton Railroad by R. Sloan and C Skowronski (Sundance Publications, ISBN 0-913582-12-3). This book accounts for why I rushed out and bought half a dozen dual gauge Shinohara turnouts and a bunch of narrow gauge turnouts. This section of my layout was never finished. The sections I had built survived three moves but never made the fourth incarnation that I am now constructing due to a lack of space. Narrow gauge can be a great choice if you're tight for space and like diminutive trains struggling up steep grades. Pick up a few copies of the Narrow Gauge & Shortline Gazette if you would like to explore this subject. Bachmann narrow gauge ON30 (Charles Ro Supply Company) locomotives and equipment have become very popular in the larger scales because they operate on G scale track. True O scale is proportionally 1:48 as stated in the above table. However, many of us grew up with Lionel trains which were slightly off-size and were known as O-27. The major competitor was American Flyer which was considered S scale. If you like to scratchbuild, S scale is a good choice because there is less readily-available equipment. You have to use your creativity and ingenuity. I haven't mentioned all the scales, such as OO, TT and NN3. OO is a popular scale in the U.K. At 4 mm = 1 foot it is slightly larger than HO. TT tried to gain a footing in the 50s. It is between N scale and HO scale. It's still possible to find some items, but this is more a scratchbuilder's realm. NN3 would be narrow N gauge. 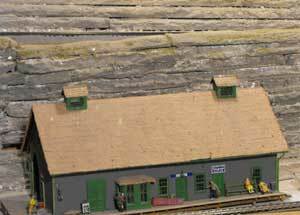 Z scale is the smallest and initially equipment was European and layouts were typical of the Swiss Alps. Now more equipment is becoming available. Aspen Models Inc. released an old-style American Tenwheeler in 2008. You can do a lot in a small space, such as a "coffee table" layout. There was a portable layout displayed in 2008 at the Brampton train show. You need good eyes and a steady hand to work in this scale! Railway gauges are roughly classified as broad, medium, narrow and minimum. Medium covers anything from 3-foot (914 mm) to 4-foot 8.5 inches (1435 mm) that is commonly referred to as American standard gauge. I am less familiar with the meter gauges in Europe and other countries. In the UK, 3-foot 6 inches (1067 mm) was a common size, slightly broader than the United States 3-foot (914 mm) gauge, a size that is sometimes considered "narrow". European meter gauge, the metric standard, was 1000 mm (3-foot 3 3/8", but there was also considerable "narrower" track at 900 mm (2-foot 11 1/2 inches. On the other hand, Australia and Russia used broad gauge that was wider than American standard. Ireland used 1600 mm (5-foot 3 inches) and Australia had about 4000 km of "Irish gauge". Russia used 1520 mm, just shy of 5-foot, and India used 1676 mm (5-foot 6 inches). Different gauges certainly caused the German army a lot of trouble during the World War II because their rolling stock couldn't run on the Russian broad gauge lines. The bogeys (wheels sets) had to be changed at the border or goods had to be transferred. The narrow gauge railways operated on track from about 600 mm (1-foot 11 5/8 inches) up to 914 mm (3-foot). The latter can be classified as narrow or medium depending on who's talking to whom. A number of narrow gauge lines survive in Germany, mainly in former East Germany, and most were 610 mm to 760 mm, or around 2-foot and slightly larger. Here in Canada, Newfoundland used "Cape gauge" (3-foot 6 inches or 1067 mm) before joining Canada in 1949. The CNR took over the railway as part of the deal. Newfoundland railways were abandoned in 1988. Some of its rolling stock and other equipment ended up on the White Pass and Yukon that operates as a Canadian and U.S. Class II narrow gauge railway between the port of Skagway, Alaska and Whitehorse, the capital of Canada's Yukon Territory. The cruise lines that run up the west coast of Canada to Alaska have made the excursion from Skagway to White Pass a popular sidetrip. The scenery is quite spectacular. (There were some brass locomotives for the White Pass and Yukon available in HO scale many eons ago. I know because a friend in Montreal had a couple of them. I don't know if they are still available. It's amazing how many gauge variations there were, and still are, around the world. If you happen to be in Britain and are visiting Wales, check out the Welshpool and Llanfair Light Railway that runs 14 km (8.5 miles) from Welshpool to Llanfair Caereinion, a small village built on the site of a Roman fort. This is a heritage railway saved from extinction by volunteers. I was fortunate to ride this line many years ago. There is also the famous Ffestiniog railway. It's in northwest Wales around Mount Snowdon and runs a distance of 21.5 kms (13 1/2 miles) from Portmadog to the slate mining town of Blaenau Ffestiniog. I got to see this one but did not have the opportunity to ride it. It is also a heritage railway and is a well-known tourist attraction. Minimum gauge lines did exist. They were mainly used for industrial, or in some cases, military purposes. This can add an interesting operating wrinkle to your model railroad if you lay in some different size track somewhere and force merchandise to be transfered. I've added one narrow gauge siding alongside a standard gauge siding so goods can be manhandled from standard gauge box cars to narrow gauge ones for the trip up the switchback. You might also consider a short length of minimum gauge, for example running in and out of a mine complex. Shaneville, on my previous Utopia Northern railway that had both standard and narrow gauge trackage , shown here, was to be the site of future transfer of goods from standard to narrow gauge cars. Of course, if you're really ambitious you can get into the big leagues with 1/2", 1" or larger scales. See live-steam at work in Lion's Head, Ontario. Lastly, you can volunteer to work on full size prototype equipment at a railway museum and help restore historic locomotives and rolling stock. Return from "track-gauge" to my Home Page. HOW TO PROTECT YOUR IDENTITY! Click here.